Journaling: "Our evening began with a bus ride from Disney’s Swan hotel to the Kennedy Space Center. As we approached Kennedy, we were able to see Endeavour all lit up with spotlights in the distance. After disembarking from the bus, we waited in line a long time before we were able to enter the complex. While waiting, Matt suggested I go take a picture of the astronaut suit hanging off the edge of the building. I guess a lot of people thought that was a good idea, since after I did it, a group of Japanese tourists copied me. Once we made it inside the Space Center, we walked around, toured the rocket garden, and shopped at the Space Shop. Then it was time to board our bus for the NASA Causeway. Around 11pm on February 6th, we arrived on the NASA Causeway. The NASA Causeway is the closest viewing area to which the general public can be admitted for Space Shuttle launch viewing. It’s located about 9.7km (6 miles) away from Launch Pad 39A. We were pretty close, but we still needed binoculars to get a good view of Endeavour from that distance. As the evening progressed into the wee morning hours of February 7th, it got colder and colder outside. We had picked a good spot to sit to watch the launch, and since I didn’t want to lose our spot, I sat shivering under 2 fleece jackets, while Matt walked around with a blanket over his shoulders. We also learned as the night progressed that the weather conditions for launch had been downgraded from a 70% to a 30%. Thus, we knew there was only a slim chance that Endeavour would launch as planned at 4:39am. As the countdown prepared to come out of the last hold at T-9minutes, the NASA test director performed his launch readiness poll of the shuttle launch team. Each member answered with a “go” or “no go”. Unfortunately, due to low cloud cover, the cape weather officer had to give a “no go”. So the planned launch attempt of Endeavour on February 7th, 2010 at 4:39am was scrubbed." 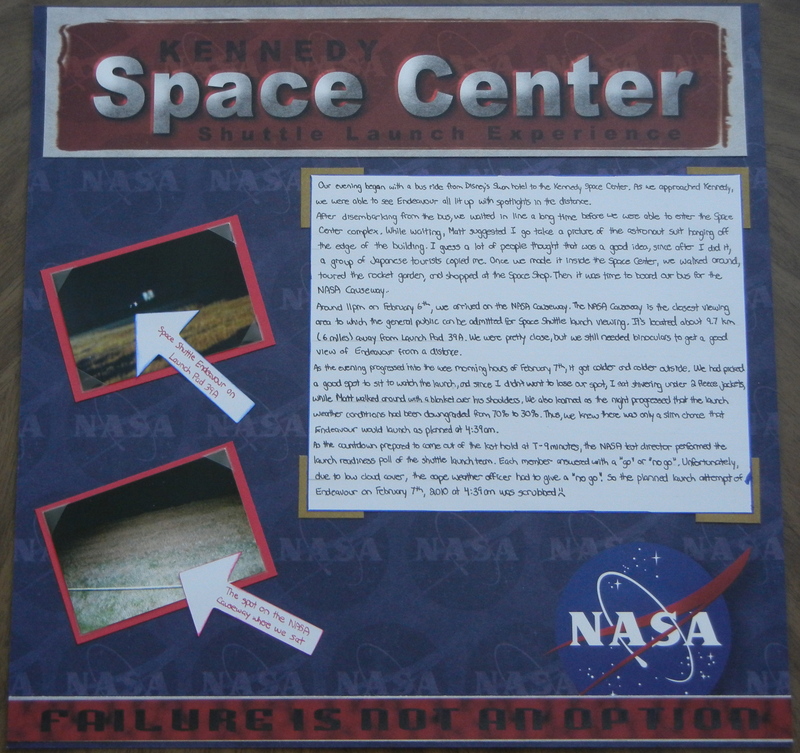 The two photos on this page aren't very good, but they are two of the only photos taken on the NASA Causeway that night. The background paper, title, and banner are from the scrapbook kit I bought at the Space Shop.